The best way to explore Britain is with unlimited train rides for 2. 3, 4, 8, 15, or 22 consecutive travel days - or one entire month - with the BritRail Pass (Consecutive). Explore England, Scotland, or Wales, and discover iconic cities like London, Edinburgh, Glasgow, and more! Simply make a booking, select the date you want to receive your pass via courier, get it activated before your travel date, and off you go. Conveniently travel around Great Britain using just one pass and have the freedom to hit the tracks anytime and at any pace you like. Not only that, BritRail Pass comes with added benefits, giving you discounts on other means of transportation and attractions. It's the ultimate way to explore the rolling hills, the vast culture and the historic attractions of Great Britain! Explore the rolling hills, the vast culture and the historic attractions of Great Britain! 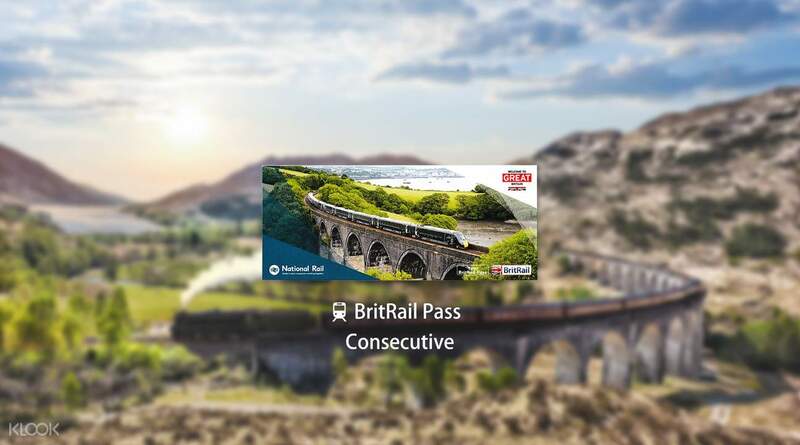 A great way to see Britain with BritRail Pass, We activated the pass at King Cross station and once activated the usage of the pass is so convenience, we just show the pass as we travel the Britain. No lining up for tickets is required. I bought the pass for family of four with the bonus for my 14 years son as he travelled for free. Further saving through my 2 teenagers kids. Britain rail system is efficient and cover most of the country, so travel by train is a great way to experience the country and the pass make it easy and enjoyable. Highly recommended to use rail pass if you plan to travel to Britain. A great way to see Britain with BritRail Pass, We activated the pass at King Cross station and once activated the usage of the pass is so convenience, we just show the pass as we travel the Britain. No lining up for tickets is required. I bought the pass for family of four with the bonus for my 14 years son as he travelled for free. Further saving through my 2 teenagers kids. Britain rail system is efficient and cover most of the country, so travel by train is a great way to experience the country and the pass make it easy and enjoyable. Highly recommended to use rail pass if you plan to travel to Britain. Fast delivery however I found my parcel just outside my door gate without prior information. Very high risk to lose the parcel. Fast delivery however I found my parcel just outside my door gate without prior information. Very high risk to lose the parcel. Thank you for choosing Klook and taking time to leave us a review! We are very sorry to hear that you had to experience such a situation. Rest assured, this is not the type of service which Klook offers or permits our local operator to provide. We will surely raise this matter to the product manager and local operator to improve and provide an excellent service to all our customers. Thank you once again for your valuable time spent in leaving us a review. Thank you for choosing Klook and taking time to leave us a review! We are very sorry to hear that you had to experience such a situation. Rest assured, this is not the type of service which Klook offers or permits our local operator to provide. We will surely raise this matter to the product manager and local operator to improve and provide an excellent service to all our customers. Thank you once again for your valuable time spent in leaving us a review. Thank you for raising your concern to us. We sincerely regret to hear about the inconvenience you experienced, and we take your feedback extremely seriously. Your case has been noted and passed to the local operator for further investigation. Our specialist had got in touch with you. Your understanding will be much appreciated. Thank you for raising your concern to us. We sincerely regret to hear about the inconvenience you experienced, and we take your feedback extremely seriously. Your case has been noted and passed to the local operator for further investigation. Our specialist had got in touch with you. Your understanding will be much appreciated. At first I tried to travel only in the province of England, but I accidentally bought a pass to travel across the UK. After a few minutes of purchasing, I found out that I wanted to cancel and cancel the purchase again. Even though the pass was not delivered already, it was only a few minutes ... I bought a pass that traveled all over the UK because there was not much additional economic benefit to re-purchase a little cheap pass, Thanks to the addition of Edinburgh to Scotland. The UK Rail Pass has been used extensively throughout the UK, and it can be used at any station or at any time, especially when the train time has changed, so you do not need to change reservations, so you can get rid of the hassle of booking a train ticket, I gave it. If you booked each train ticket each time without using the pass, you would have heard more than about 100,000 won as well as the hassle. 처음에 잉글랜드 지방만 여행하려고 했는데 잘못 클릭해서 영국 전역을 여행하는 패스를 구매하게 되었습니다. 구매 몇 분 후 이를 알게되어 바로 취소하고 다시 구매하고 싶었는데 구매 사이트에서 환불수수료를 물어야만 취소가 가능하다고 하였습니다. 패스가 이미 배송이 된 것도 아니고 불과 몇 분 차이였는데도... 환불수수료를 떼고 잉글랜드 지역만 다니는 조금 저렴한 패스를 다시 구매하는 것이 별로 추가적인 경제적 이득이 없어서 영국 전역을 다니는 패스를 구입하게 되었습니다. 덕분에 스코틀랜드의 에딘버러를 여행 일정에 추가하였습니다. 영국 여행 기간 내내 영국 철도 패스는 참 요긴하게 사용하였고, 특히 기차 시간이 변경이 되어도 그때 그때 예매 변경할 필요 없이 아무 역에서나 아무 시간에나 이용할 수 있어서 기차표 예매의 번거로움을 없애주고 기차여행의 즐거움을 충분히 주었습니다. 만일 패스를 이용하지 않고 각각의 기차표를 그때마다 예매했다면 번거로움뿐 아니라 금액도 약 10만원 이상 더 들었을 것 같습니다.